Paranormal private investigator Cal McDonald comes face-to-face with the zombie-killing palooka known as the Goon, and ultimately joins forces with him to defeat a man who is bringing his imagination to life with an occult tome. The man summons Hellboy, who Cal recognizes, before being defeated. The exploits of Eric Powell's adventurer the Goon take place in the present day, but in a very surreal world with 1930s trappings, and therefore likely occur in an alternate reality to the Crossover Universe. However, both P.I. Cal McDonald of Steve Niles and Christoper Mitten's comic Criminal Macabre and Mike Mignola's monster-fighting demon Hellboy (whom the Goon met in a 2004 issue of his own title) have independent links to the CU, and given that Cal knows who Hellboy is, it is very likely that the two were transported to the Goon's universe from the CU. I really wish I had bought this when it came out. Particularly since I've been rereading my Goon trades. 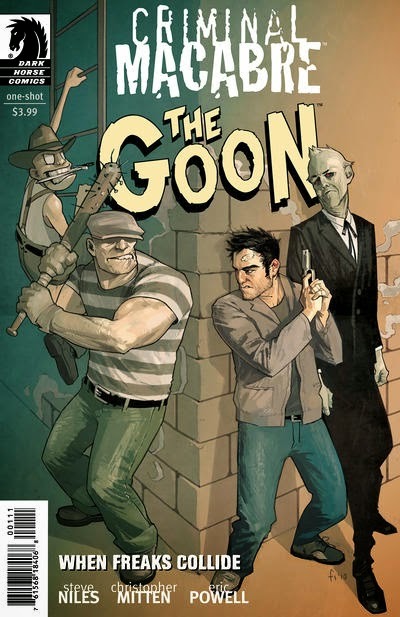 One of the trades has an introduction which theorizes that the Goon is set in The Spirit's Central City. Aside from the fact that The Spirit's comic is not as surreal as the Goon, Central City is obviously a Northeast metropolis, while everyone in the Goon speaks in Southern idiom.